1. Come up with a cool theme or set of cards I want to play with. 2. Start working on it, and the first 20-30 cards just write themselves into the deck. 3. Go searching for other cards to see what else I should be using. Look on Scryfall for things that match the theme, EDHRec for things that fit within the color set or commander or tribe. 4. Start to stress out and self-doubt over whether I'm doing it right, going overboard on a theme ("there's just too much +1/+1 counter stuff in this deck"), or making a deck that's going to be unfun or too powerful to play against ("there's just too much -1/-1 counter stuff in this deck"), losing the picture of what I was supposed to be making, or something else like that. 5. Finish off the deck on tappedout or from my collection but feel like I've done something wrong & not build it or take it apart again. I thought I was just getting this with just one deck I was overly invested in making, but as I've been working on other deck ideas (especially since I saw that 26-deck challenge) this seems to happen universally. Does this happen to others? How do you move past those effects & actually make something fun that you're happy with, or avoid having them happen to begin with? I think the stress and doubt stage in #4 is universal (though maybe some stress/doubt less). I don't think it's easy to get a deck 100% right on the first pass every single time. You have to play it against a lot of decks and really get a feel for it before you can say that "Yes, this is the build that's right" and, even then, there's always going to be a couple of cards where you could play something slightly different for a more or less strealmlined effect. I have just built an Oath of Druids deck and, in both games, not getting an early Oath onto the field meant I was playing a GW control deck with overcosted threats. I played 2 games, losing both and already there's 4-5 cards I know I should have put in there. Sterling Grove? Expedition Map? Obvious now that I've played the deck : my goal is to find Oath regularly, trigger it regularly. Why wouldn't I add these pieces? Why indeed! Is the general I chose the one I should have chosen? If I switch him out, does he get dropped or put into the 99? Who replaces him without making the deck about another theme? Do I add extra colours now or see if I can make the best version of the deck in the current colour scheme before branching out? Everyone does this. It's the fun part of seeing if your idea works, if you executed it correctly and what necessary stuff did you forget about. Is card X just too much for your regular group? That sort of thing. Your reactions are entirely normal. Thanks zimagic, that's such a relief to hear. Also a pretty helpful sort of reality check: I'm used to decks which work reasonably well right off the bat, but... that's because I'm used to playing with the precons. I shouldn't expect everything I do to work just as well until after some playtesting. Yuuuuuuuuuuuuuuuup!!! I have the same problem ALL THE TIME. The nice thing about this is when I get it right, I know it. Everything clicks and I rarely have too many cards to filter out. I try to go about it logically with different control gates I have to pass before going on. 2. Next, I start by thinking about how I want the deck to win. Combat damage? Token swarm? Voltron? Token abuse? ETB/LTB abuse? Direct Damage? Mill? Explicit win? If I can't reconcile the win-type with the commander/archetype I go back to 1. 3. Once I have a win-type I start looking for cards that support that method. If I can't find enough to support it, back to 2 I go. 4. I'll start looking at goodstuff/staples to support the plan. If I have more staples than win supports I"ll go back to step 2. 5. Last step is to craft the general mana base (sans lands that support the plan). I'll go through all the cards and try to look at it from a high level view and imagine if it'll play well and be fun to play. If it looks like the deck will be reliant on a small number of cards (not counting the commander) I'll look at going back to step 3. I am with you through step 3 and then I just play the deck over and over again to weed out the cards that aren't consistent. Sometimes I get to the point where the work of making the deck come together becomes me copying other peoples decks. At that point I start to take them apart. I like to be on the more creative side of playing, figuring things out and using cards that people don't remember or say are bad (to a degree). I get much more enjoyment out of the deck building experience that way. I feel similar. Recently my main problem is that I find too many cards to go into the deck and I have a hard time getting it down to just 100. And then I feel like it isn't keeping the theme or idea around what I want to do with the deck. I have been trying to look at things differently and figure out what I am lacking in making the decks work like I want I want them too. I still try to put too much into the deck though I have a hard time cutting things to make room for what is needed. I think I am getting better though. There's always some hem and hawing with deckbuilding, but that's why we test. 1- Put my desired number of lands in the deck (not the final lands I'll use, just for count - the rest are off to the side). 4- Add the must-have theme non-creatures to the deck. 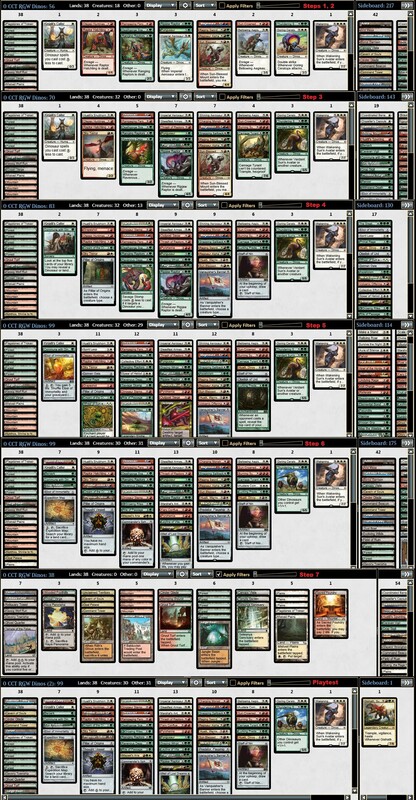 5- Fill out the remaining non-creatures, accounting for color balance and mana curve, so the deck is at 99 total. 6- Review each card that is set aside, looking if there is anything in deck I would replace with that card. Look for deficiencies in Removal, Draw, Ramp or niche vulnerabilities (GY, control, evasion, etc.). Especially identifying any "staples" to replace with more themed versions for a similar effect. Playtest, and repeat steps 6 and 7 as needed.